Keep all of your handheld power tools conveniently stored with this complete solution. 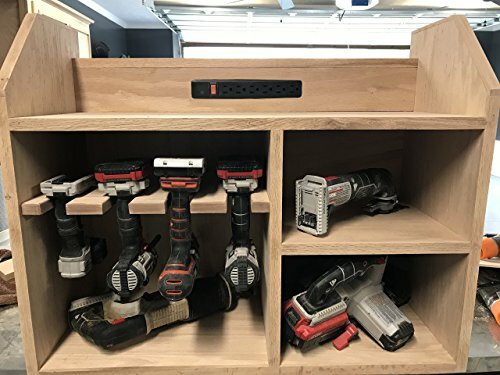 This cabinet includes a built in power strip to connect your battery charging docks and also offers plenty of storage for drills and saws. Made from REAL WOOD, this cabinet will stand the test of time in any situation. The outside dimensions are 30" x 24" x 12". There are four seperate comparts for your tools. One compartment will hold four handheld drills hanging upside down. The other three sections are sized to hold skill saws, reciprocating saws, flashlights or other battery operated tools. The top shelf is designed to hold your charging blocks with a conveniently located power strip. This is handcrafted and built to last, NO ASSEMBLY REQUIRED! If you would like a coat of stain applied, just select it in the options below and we will contact you to discuss which color you would like. If you have any questions about this product by Bellewood Designs, contact us by completing and submitting the form below. If you are looking for a specif part number, please include it with your message.